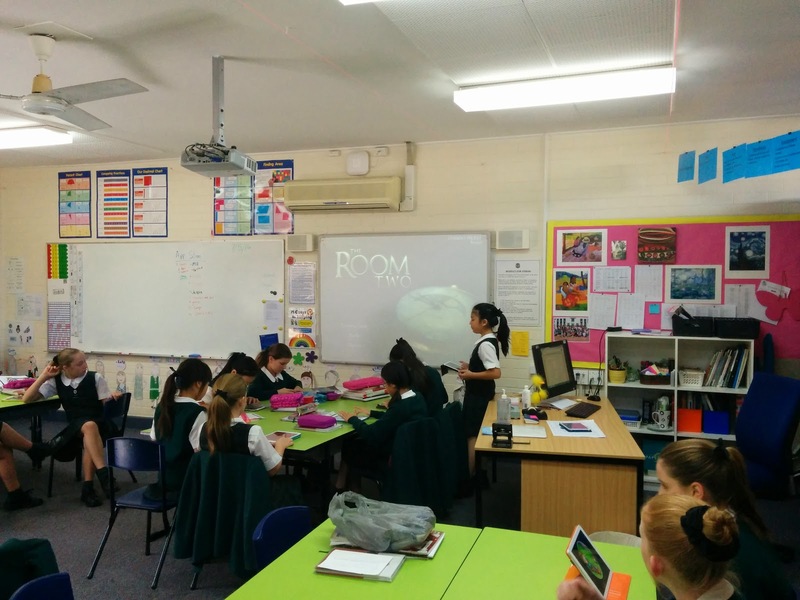 I had the chance to take one of our Year 6 classes this morning while their teacher was away. This class is part of our BYOD iPad program where every student brings their own iPad. Borrowing the Slam idea from the Google Summits, I got them to do an App Slam. Every student was given an opportunity to voluntarily participate, and they had 2 minutes to share an app, game, tool, tip, etc with the rest of the class. I said it could be anything at all, just something that they enjoyed using and would like to share with the class. I was amazed at just how eager they were to do this, and they were figuratively falling over themselves to add their name to the list of presenters. As they each did their slam (which of course they had to end by shouting the word Slam!) I added their name and the thing they demoed to a Google Form. 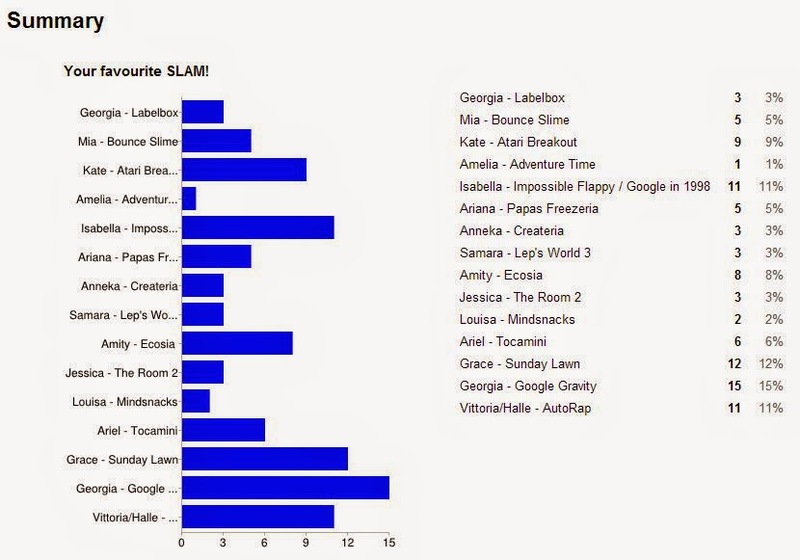 After the last student presented I simply published the form, gave them the short URL to access it and let them vote for their 5 favourite slams. I particularly liked the fact that, of all the apps and games and things they shared, I was only previously aware of two of them. Part of the magic of having a BYOD approach to our use of iPads is that the kids are discovering apps and things that I would probably not. 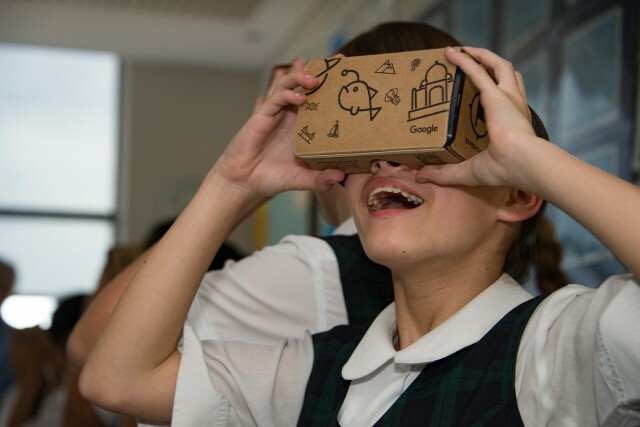 It’s pretty clear that the students feel far more in control of their own learning when they are the owners of the technology. I also found it interesting that, when we allowed our kids to bring their own choice of iPad, they brought in a diverse range of iPad configurations. Some were using older iPad 2s and 3s, some had newer iPad Airs, some chose to use iPad minis. Everyone seemed to have a different kind of case, with lots of different styles and colours and types. Some had chosen to use bluetooth keyboards because they wanted to, others were perfectly happy with the standard on-screen keyboard. The thing is, had our school decided what type of iPads, cases and accessories they should be using and dictated the size and configurations they should be, then a significant number of our “customers” would have ended up using something other than what they actually wanted to be using. If we take a one-size-fits-all approach to giving technology to kids, we run the risk of making choices that disappoint our end users. Is BYOD the best approach? I don’t know but I thought this next fact was food for thought… I was talking to a teacher yesterday from another nearby school that also went 1:1 iPad, except they took a non BYOD approach. Their iPads were school provided, highly locked down, kids could not install their own apps, and they were being used for little more than digital textbook readers. In their first year of operation they had $14,000 in damages! In contrast, we’ve had virtually no damages at all. It turns out that students look after their stuff when they own it. What a concept. While not every student might want to write their own software, understanding the big ideas of coding is a skill that all students would benefit from, even the very young ones. Understanding the key ideas of computational thinking – identifying patterns, thinking algorithmically, manipulating data, solving real problems, etc – is an important step in helping our students build mastery over their world. 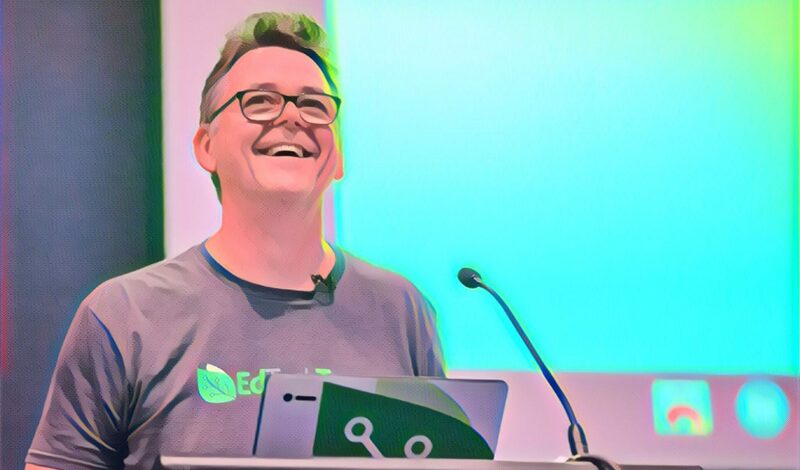 This presentation aims to take you on a guided tour through some of the resources available to your students to help them learn the principles of creating code. It starts by looking at a range of desktop and mobile apps suitable for teaching very young students to program, right through to tools and websites that can help your older students learn to hack code, and much more. If you do actually try any of this stuff out, I’d love to hear your thoughts in the comments below. PS: This is my fourth contribution to the K12 Online Conference, and I think it’s a great format for an online event. I like how it drip feeds out a bunch of presentations over a 2 week period online, but continues to make them available as a permanent archive. There is quite a collection of presentations in there now. Check them out!